Readers are Leaders!!! If you have not had a chance to pick up this book–it is a must read. 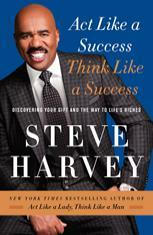 Steve Harvey has one of the best stories of Success I have ever heard. Not only will you be inspired by his book. I truly believe this book will cause you to act on your dreams. One thing I know for sure, God is no respecter of person, which means if he did it for him, he can do it for you. Steve breaks the book down into 4 parts: 1. When Enough is Enough; 2. Discovering and Embracing Your Gift; 3. Maximizing your Gift; 4. Creating Your Legacy. Get this book today, I promise you it will help you transform your life.